Things to do in Florence when you're Seven - Who's the Mummy? This Easter, Flea and I were set the challenge of spending 100,000 Starpoints on a trip somewhere fun. No rules, no guidelines, just – go somewhere and have fun. 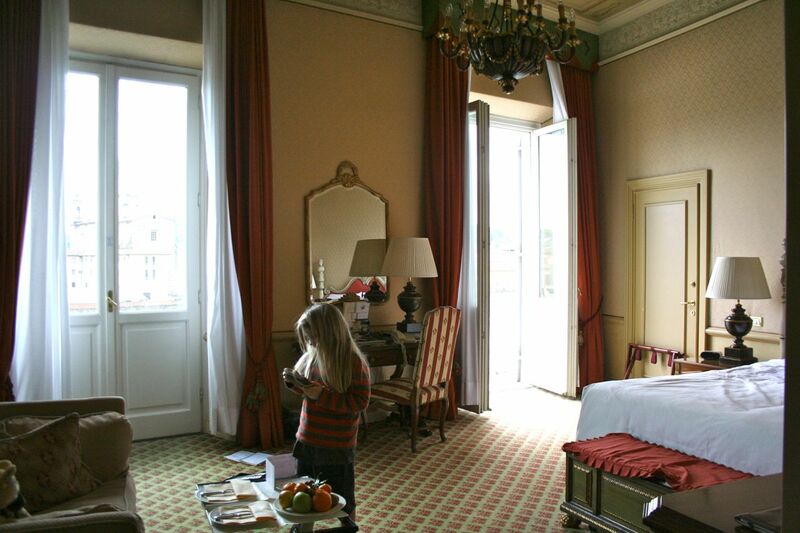 And so it was we ended up booking two flights to Florence for a three-night stay at the Westin Excelsior Hotel. After I booked the hotel, I asked my Twitter followers what fun things there are to do in Florence. “There are a lot of bridges,” said one friend. “It’s very pretty,” said another. It didn’t look promising. Nobody seemed to have any ideas of really fun things to do with kids in Florence. So I hit the Internet and did a bit of research – and ended up having a fantastic few days in one of the most beautiful places we’ve ever visited. After a quick shower, Flea and I set out on the 10 minute walk along the Arno from our hotel to attend a cooking class where we learned to make our own pizza and gelato. This was such good fun – there were around 20 students in the class from all over the world, and we started out making our pizza dough, then while the dough was left to rise, we set about making chocolate gelato. While the gelato was in the ice cream maker, we returned to our pizza dough, rolling it to a circle, topping with tomatoes, mozzarella, chilli flakes and basil, before popping into the hot oven for 3 or 4 minutes to cook. Throughout the evening, we got loads of tips on making dough, selecting ingredients, and why Italians make certain foods the way they do from the two Italian chefs running the class. At the end of the evening, we chomped down our pizza with a glass of chianti for me, and a Coke for Flea, finishing off with chocolate gelato. Perfect! I can definitely see us using the pizza recipe again (we’ll blog it) as it’s ridiculously easy and tasted fab. The next day, we set out to see the sights of Florence. We soon found ourselves at the Duomo – a gorgeous church of pink, green and white marble. You can climb the 463 steps to the top of the dome if you’re feeling energetic – we weren’t, so we opted instead for a horse and carriage ride along the banks of the Arno, which we both sneezed our way through (turns out we’re allergic to horses). We jumped off halfway round the tour to check out Bartolucci – a gorgeous little shop packed with wooden toys, clocks and children’s decorations – Flea came home with a fab wooden sword and some presents for her school friends. We also loved Gilli, a 200-year-old cafe and confectioner with the most amazing hand-made chocolates and cakes. After that, we headed to the Uffizi, home to some of the world’s most famous renaissance paintings. We opted for a guided tour which was a good option as our guide was amazing, making the tour more of a discussion than a lecture – we learned loads, as well as getting to see masterpieces like Botticelli’s Birth of Venus and La Primavera, and Doni Tondo by Michelangelo. I’m not sure I’ll ever quite recover from the effort of not laughing at the child Flea’s age sitting dead in front of the Birth of Venus and playing Subway Surfer on an iPad. Kids, eh? Having a guide meant Flea could ask questions and follow a lot more of what went on so she didn’t get bored despite the tour taking well over three hours – seeing Flea’s face as the guide said, “So, Bambina, is this painting renaissance or baroque?” and watching Flea get the answer right was quite a moment. Cultured out, we headed off to the rather unassuming Il Vico del Carmine for dinner – the concierge at the hotel said this place makes amazing pizza and he wasn’t wrong. The interior is spartan with plaster walls and iron gates between tables, but the food is really lovely, the pizzas fresh and tasty, and pretty good value – dinner for two with drinks and dessert came out at just under 30 euros. 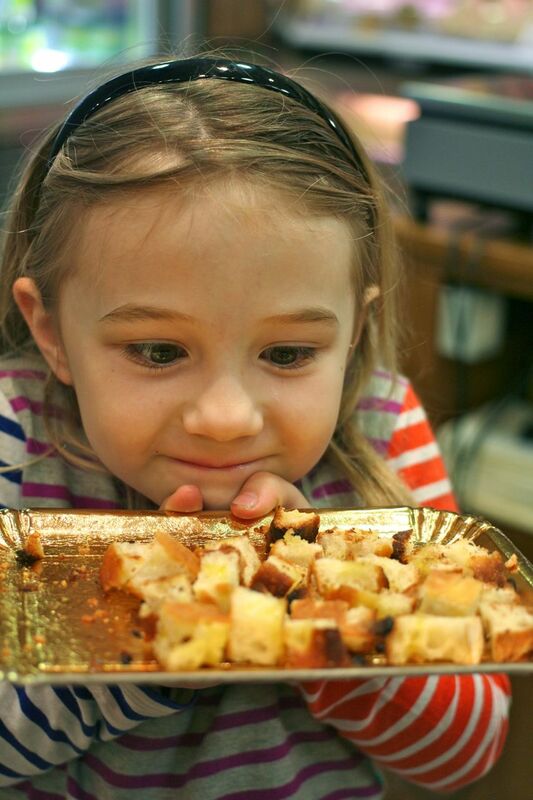 Next morning, we headed off to Florence Central Market for a VIP tour with local food sellers to learn about Italian food – beginning with a session where learned all about different olive oils, balsamic vinegars and cheeses – with tastings. It’s quite amazing (to me, anyway) that you REALLY can tell the difference between a balsamic vinegar that’s been aged for 4 years versus 15 years. We picked up loads of tips on cooking and simple but impressive looking foods to serve, before heading off to meet with the baker to learn about Tuscan bread (made without salt) and truffles. Apparently white truffle is an acquired taste, but Flea loved it, wolfing down about 20 pieces of the bread topped with white truffle salt. If you are a foodie, this place is AMAZING – I’d have loved to have had more time to just wander round and look at everything. 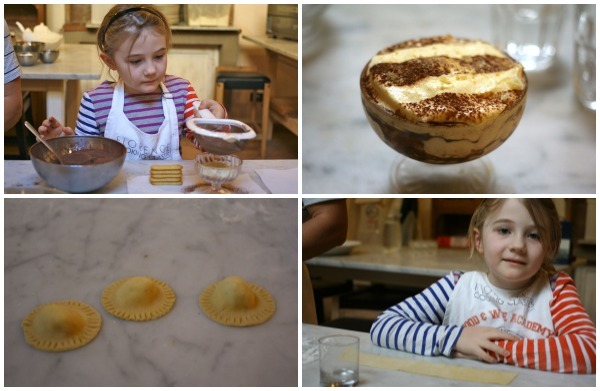 Next, we headed back to the cookery school where we were to make our own 4-course Tuscan meal – bruschetta, followed by 2 pasta dishes (bolognese with pappardelle and ravioli with ricotta and a sage butter sauce, followed by Tiramisu). I’ll be honest, making pasta is a lot fiddlier than pizza – but we triumphed and look – I cooked! All made with our own fair hands, and it tasted flippin’ amazing, which is worth the price of the trip alone, possibly. Exhausted and full, we headed off for an afternoon’s shopping – mostly of the window variety, since Florence is home to a dizzying number of designer shops. There are gorgeous buildings everywhere and we loved just wandering round enjoying the sunshine and the views. For our final evening, we dined at SE-STO in Florence – this is the restaurant on the sixth floor of the Westin hotel. 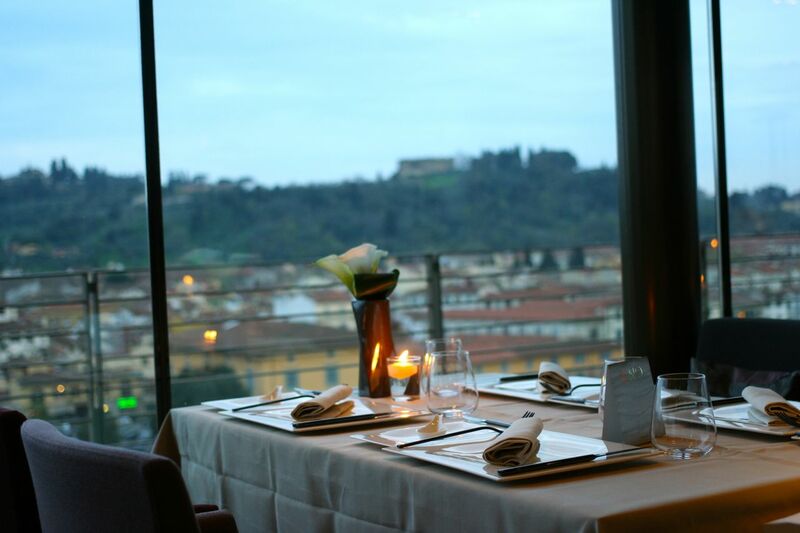 It has the most glorious floor-to-ceiling glass windows, proving quite magical views of Florence, the Arno and the Tuscan hills beyond, especially at sunset. It’s a fancy restaurant, yes, but it’s not stuffy – the waitresses all took the time to learn Flea’s (actual) name and explain what was in each dish, and offered to provide some plain spaghetti with tomato sauce for her main course. Having said that, Flea did amaze me by wolfing down a starter of chickpeas flour mille-feuille with prawns and sweet peppers cream. I had the same, followed by carnaroli risotto with beetroot, Bagoss cheese and Cava wine sauce – it was pretty amazing (and as is the rule whenever I dine in a fancy restaurant, yes, I did spill half of it down my front). A fitting end to our short break, I’m sure you’ll agree. Notes: We travelled to Florence as part of a review trip for Starwood Preferred Guest Credit Card from American Express. We booked our cooking classes and food tour through Florencetown. 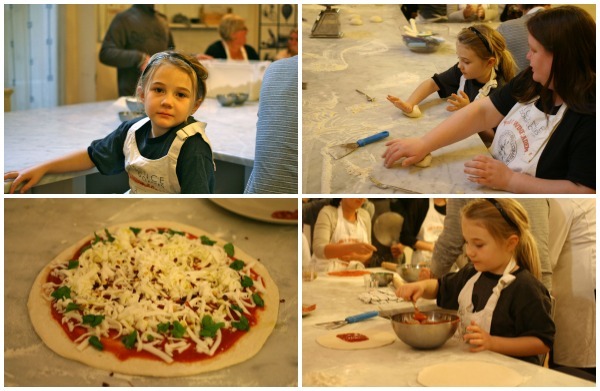 The pizza and gelato workshop cost 45 euros for adults and 23 euros for children aged 6-12; the VIP market tour and tuscan cooking class costs 125 euros for adults and 62 euros for children. 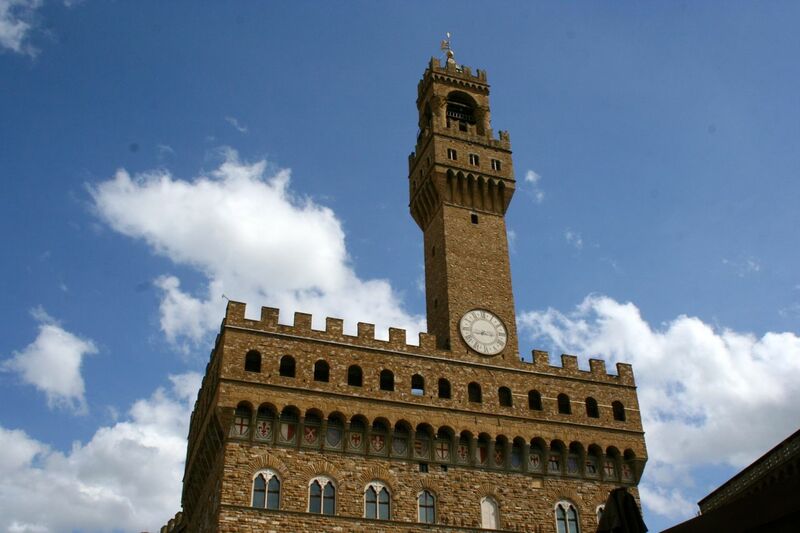 The Uffizi and Vasari corridor tour costs 85 euros for adults and 50 euros for children. If you’d like to see them, there are more photos of our trip over on Facebook. Previous Post April 6 : Just another day. *sobs* Florence is the one city in Italy I haven’t visited and is on my bucket list. Your trip looks and sounds amazing. Very jealous! Jean recently posted..The F-word: why is feminism still a dirty word? I do admire how you always find child-friendly things to do and that Flea is always game for them. It sounds fab. Omg you made pizza AND gelato in one sitting. GG would have been happy in Essex, but I would totally have followed you to Florence for that! Actually Mummy… recently posted..Do you really want to be a parent? It is gorgeous, isn’t it? I’d love to explore Siena and the countryside around Tuscany some time. What an absolutely wonderful trip but also a really comprehensive review showing such fun and learning about the culture. It’s obvious that you both had a marvellous time there, just the thing you needed! Thanks – it was really good fun, we always enjoy these kinds of short breaks, and I think kids love them too. Lucky you! Florence is lovely and with a bit of imagination, I think kids would love it, too. Cooking turned out to be an inspired idea, Flea loved it, and I think it gave us a really different insight into the country to cook with Italian chefs. Wow, sounds like an amazing trip, and cannot wait for all the recipes. We love Italian cousine in our house, and would be lovely to know how to make nice pizza from scratch. What was the weather like? Mirka Moore @Kahanka recently posted..Win a Mamascarf and Snoodie Bundle! Thanks Mirka, the pizza recipe is a winner, if we can recreate it! The weather was lovely – not TOO hot, but sunny and warm enough for t-shirts while we walked around. Perfect. Your trip looked beautiful, too! Not jealous. Nope not at all. That’s good because it was rubbish, honest*. Wow looks a beautiful and fun place to visit and ideal for a few days away too with a toddler. Hmmm 🙂 you’ve made my mouth water with all those descriptions and food pics! IT was AMAZING food, it really was! It looks like you both had an amazing time Sally! Wow – love all your photos too! Sounds amazing, sun, food and Italy. Thanks for the inspiration to travel with children which can always be rather daunting. I bet the italians loved your daughter. Hi Orlena, thanks for commenting! We love travelling and I’ve taken Flea on my travels since she was very small – if you’re a bit flexible, I find most places are very welcoming and we’ve always had a lovely time in Italy. This review has done exactly what it should do…I just want to go now! Fabulous photographs, the whole thing looks amazing. The cooking classes, seem really reasonable too. Always wanted to visit Florence, that hotel looks absolutely stunning! Looks like you had a beautiful time. May I ask which camera you use? I love the photography. Aw, thanks. I just use a Canon Digital Rebel and I took the regular lens and a pancake lens with me that I bought myself earlier this year. 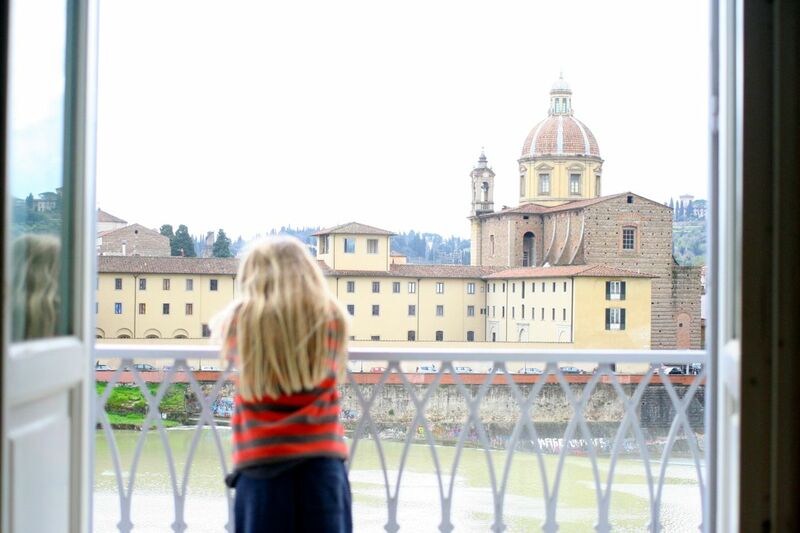 Hey Buddy!, I found this information for you: "Things to do in Florence when you’re Seven". Here is the website link: https://www.whosthemummy.co.uk/things-to-do-in-florence-with-kids-children/. Thank you.